Eventually, I should probably learn how to create my own Sudoku puzzles for kids. 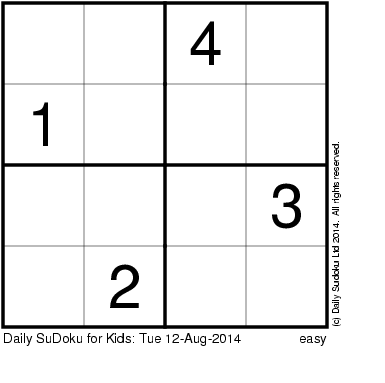 But luckily for me – and for you – I happened to come across The Daily SuDoku, an awesome site that publishes daily SuDoku puzzles for kids. Woohoo! Yippee! But wait, it gets even better…they’ve allowed Kids Puzzles Online to post their daily puzzle right here, which means, you can visit me every day to get your daily Sudoku fix for your child. And as we we all know, Sudoku puzzles are so addictive you can’t stop at one, so guess what? I’ll also be bringing a selection of 500+ puzzles from The Daily SuDoku archives for you to go crazy on. I just have to get the right permissions, etc. to make sure it’s ok.
Now, just a quick heads up. 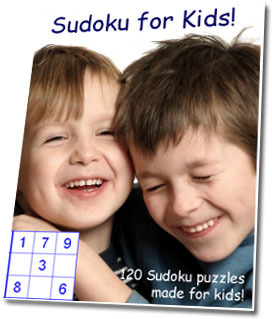 Even though The Daily SuDoku puzzles are thoughtfully designed especially for kids, it doesn’t mean that all the puzzles are “easy.” So, be sure to check the level of difficulty first so as not to scare off your kids from Sudoku on their first go. Anyway, here’s the first installment. But going forward, you can also access these daily puzzles on the Sudoku page. I believe that you can do with a few percent to power the message house a bit, but instead of that, this is magnificent blog. Pretty nice post. I just stumbled upon your blog and waentd to say that I’ve truly enjoyed browsing your blog posts. In any case I’ll besubscribing to your rss feed and I hope you write again soon! Techozoic 2.1.1 by Jeremy Clark. | 37 mySQL queries in 0.874 seconds.